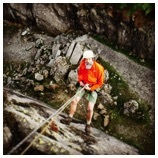 Spend a day trying rock climbing on real rock in Snowdonia. Learn how to tie yourself onto the rope and to belay. 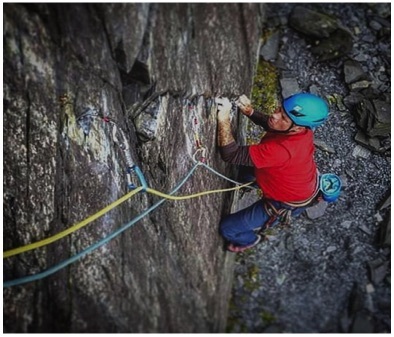 You will spend the day rock climbing at a crag in Snowdonia enjoying movement upwards over rock, perhaps facing a fear of heights to feel a great sense of success at the top of each climb you try. Your instructor will choose the best venue for the weather conditions - you may be enjoying a mountain environment or a coastal one - which ever you end up at you will have a brilliant day rock climbing in fantastic surroundings. Bouldering is climbing on small rocks (boulders) without the use of ropes. The idea is to try something that challenges you but is safe enough to step off if you cannot do it. Bouldering helps climbers to become stronger and is a good form of exercise as you can get lots of climbing done on small boulders. Ideally a dry day, however we can usually find a crag that is sheltered. Abseiling is a techniques used by rock climbers to safely get themselves back down from a cliff, or to the bottom of a cliff to climb back out. It is also an exhilarating activity to try if you are not a climber. You need to be prepared to push yourself over the edge and control your speed down a cliff whilst hanging in your harness from a rope. Abseiling can be done as part of a Rock Climbing day or as a half day activity combined with Gorge Scrambling, Sea Level Traversing or Coasteering.